This Tuesday, Barça Innovation Hub and ESADE signed an agreement to promote academic projects to share and disseminate knowledge in the field of sports management studies. Out of this agreement, the two institutions will be offering an Executive Master in Global Sports Management, a course that supposes the first accord between this prestigious business school and a sports club. The major attraction of this masters degree is that much of the content will be based on the FC Barcelona sporting model and culture, based on real-life situations and given by professionals that currently work at Barça, and who, as part of the Barça Innovation Hub, share the knowledge and experience that has been accumulated in the different areas of the club over the years. ESADE considers FC Barcelona to be one of the world’s leading sports organisations of the moment in terms of the management of its knowledge, talent and brand, characteristics that make it unique in the world and worthy of exposure as an example to students and professionals from the sector. Through the Barça Innovation Hub, the club is building partnerships with leading academic institutions and universities around the world to organise masters degrees, courses, seminars, conferences and symposiums at which it presents and shares it knowledge in such areas as Team Sports, Performance, Medical Services and Nutrition, Technology and Social Sciences. The agreement was formalised this morning at the FC Barcelona offices in the presence of Òscar Grau, CEO of FC Barcelona; Javier Sobrino, FC Barcelona director of Strategy and Knowledge; Eugenia Bieto, CEO of ESADE, and Jordi Brunat, director of Executive Education at ESADE. The masters is directed at professionals that work for federations, sports, professional leagues and organizations connected to the sports world, mainly in Spanish speaking countries. These studies offer knowledge for the leadership of sports businesses, and skills for promoting sponsorship, marketing and communication activities, and will help to make contact with the most prestigious institutions in the sporting and academic worlds, thereby offering a transversal and practical overview of the industry. Argentina and Chile, where agreements have been made with such prestigious institutions as Universidad de San Andrés (Argentina), Universidad de Los Andes (Colombia), and Adolfo Ibáñez Business School (Chile), the Johan Cruyff Institute and Blanquerna (URL). The programme concludes in Barcelona and the participants will receive the certificate of Executive Master in Global Sports Management (ESADE). Through this new agreement, Barça Innovation Hub is extending its educational offer and taking a giant step forward in boosting its academic relevance and global scope. The aim of the project is for FC Barcelona to change the world through sporting excellence by sharing knowledge and innovation, creating new products and services that can benefit the athletes at the club, its fans and society in general. “I would like to thank FC Barcelona for its commitment to innovation and excellence, thereby projecting its image as a brand that’s hard to match. 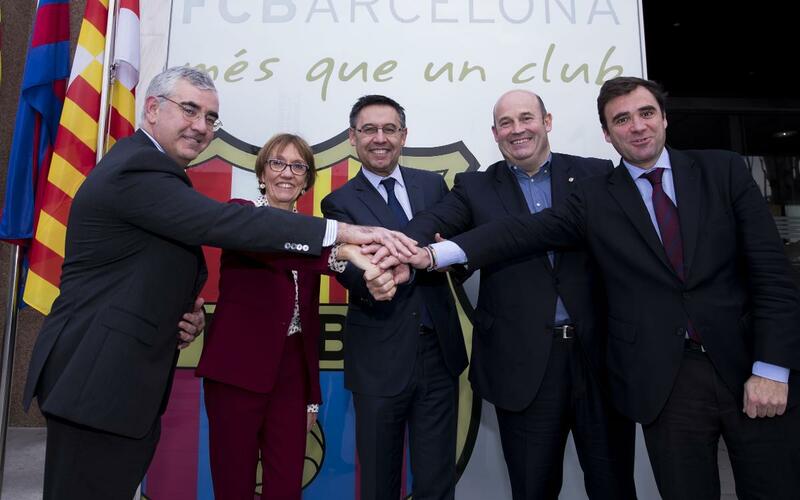 ESADE has decided to work with FC Barcelona because its role in the sports industry is so relevant, which makes it the best strategic partner”.